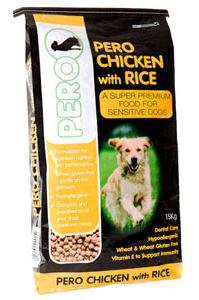 Pero dog food was launched back in 1985 in North Wales. Their range of products on offer includes diets for all life-stages and requirements. It's a bit of a mixed bag of products, ranging from cereal-based to premium natural and organic recipes. Pero has a strict no animal testing policy and all of their ingredients are certified as cruelty free. 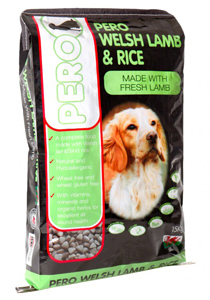 Their original product, Pero original, was created by the company’s owner as a way to feed the local welsh farm dogs, which high quality and nutritious food. Since then, the company has expanded and their products now sell across the UK. The natural foods that Pero offer are good quality and fairly priced so have a lot going for them. They use a mix of grains, rice, oats and barley, which are generally considered to be easily digested. The basic natural foods in the range offer good value at £29-£35 for 15kg. 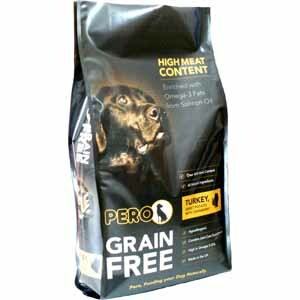 The Grain Free option is a bit expensive at £53 for 12kg! Turkey 40%(Fresh Turkey 16%, Turkey Meal 24%), Sweet Potato 43% Peas, Pure Chicken Oil, Alfalfa, Minerals, Chicken Digest, Yeasts, Linseed, Salmon Oil, Cranberries (0.4%), Prebiotic MOS, Prebiotic FOS, Yucca Extract, Glucosamine, Chondroitin. Vitamin A 24,500 IU, Vitamin D3 2,450 IU, Vitamin E 245 IU Trace Elements: Zinc chelate of amino acid hydrate 333mg, Zinc sulphate monohydrate 194mg, Manganese sulphate monohydrate 78mg, Cupric sulphate pentahydrate 40mg, Calcium iodate 2.46mg/kg, Selenised yeast (inactivated) 87mg Antioxidant Rosemary Extract .